How to mount art; archival mounting of prints, drawings, paintings and more. Art Mounting Panels are archival & reversible. For archival mounting of finished artwork, paper, and canvas. The mounting surface has a heat activated reversible conservators adhesive. Artwork is easily mounted with heat and light pressure. Art Mounting Panels have slots in the back to hang art in either direction without the need for framing. How to mount works of art, prints, drawings, and paintings, paper or canvas. Remove protective film from the adhesive side of the mounting panel. Apply surface to be mounted; A painting, drawing, print, photo, fresh paper or raw canvas. Place a clean cover sheet of paper over the surface that is being mounted. Move a heated iron over the cover sheet to adhere the art to the mounting panel. Place the panel face down and trim off the excess using the edge of the panel as a guide. For archival mounting of art: prints, drawings, and paintings. And for mounting of canvas, linens, and papers to make art on. Mounted art can be removed at any time for art conservation. Art Mounting Panels hang flush on the wall with or without framing. Archival Mounting Panels are for mounting all art work, paintings & drawings. Mounting Panels are for artist to archivally mount any surface to make art on. Mounting Panels for mounting printmaking prints. Art Mounting Panels are Archival and Reversible. Archival Mounting Panels made in 12 stock sizes & in any custom size. Art Boards™ Archival Mounting Panels can be ordered in any size. How to Mount Prints, Drawings, Paintings, and Photos. Custom Size Mounting Panels Are Available as large as 60" x 120"
Art Boards™ does Custom Mounting of any size Art on a variety of surfaces. Custom mounting of art includes drawings, oil paintings, watercolors, prints, photographs, digital prints on paper, and paintings made on canvas and linens. Art on paper can also be mounted on canvas or linen and stretched over conventional canvas stretcher bars or mounted to our archival panels. 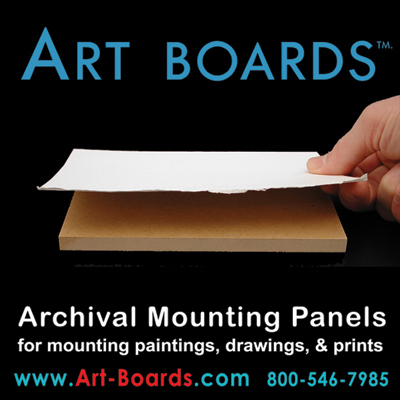 Art Boards™ mounts small to very large art archivally on to canvas or panel. Paintings and drawings can also be mounted to Natural Maple Panels. Any weight drawing paper can be mounted including synthetic art papers like Yupo. Mounting of paper or canvas can be done before or after the art is made. Art mounting is reversible. Art can be removed from the substrate if ever needed for future conservation of the art. View Mounting Art on Panel video here. For storing mounted drawings, paintings, prints, and photos. 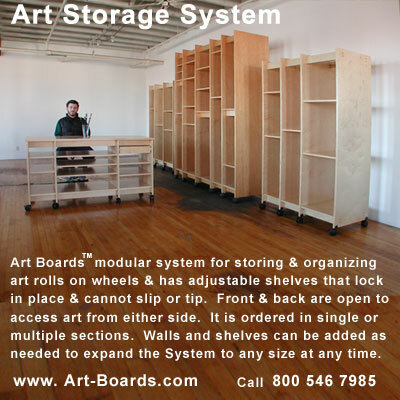 See Art Boards™ Art Storage System. Art Mounting Panels are made in Brooklyn, in the USA.